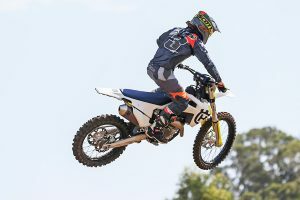 MotoOnline.com.au tests the 2019 KTM 250 SX-F.
KTM has an outstanding track record in the MX2 World Championship and it isn’t hard to see why – no matter how much they win, they’re always trying to improve their base product and continue to raise the bar of production bikes year after year. After speaking to one of the engineers at dinner, it was made clear to me that they are really trying to close the gap between the factory bikes that race within the world championship to the one you purchase from the dealership. Pista Malagrotta is the track where we were given the chance to test these bikes and it did not disappoint. Located approximately 30 minutes from Rome in the small town of Malagrotta lies the test track of Antonio Cairoli – it’s quite an undulating circuit with a variety of different soils, from hard, stony, rutted corners to soft and sandy whooped out ones. It had a range of different jumps and obstacles, but mainly table-tops and rolling whoops. 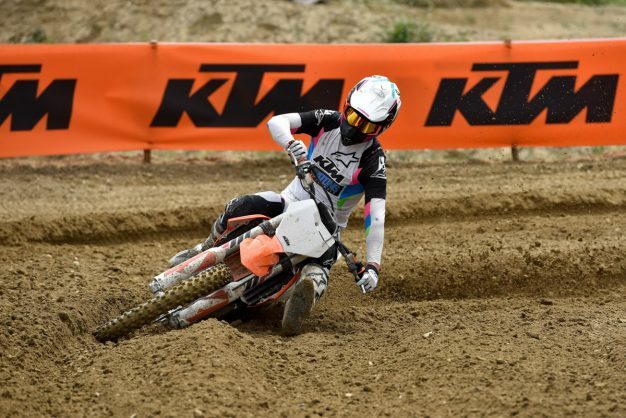 The track was quite technical with the varying surface changes and the camber on some of the turns, it really proved to be a quality test track to get the most out of the bikes we were fortunate enough to ride. 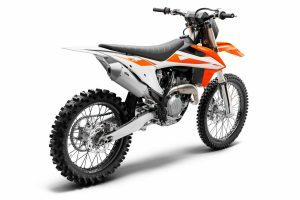 The 2019 KTM 250 SX-F has been equipped with a various range of refined updates in both the engine and chassis department. These updates include upgrades to the exhaust cam timing, exhaust system, air box and engine management system, allowing the engine to now boast a broader and stronger power curve across the board. 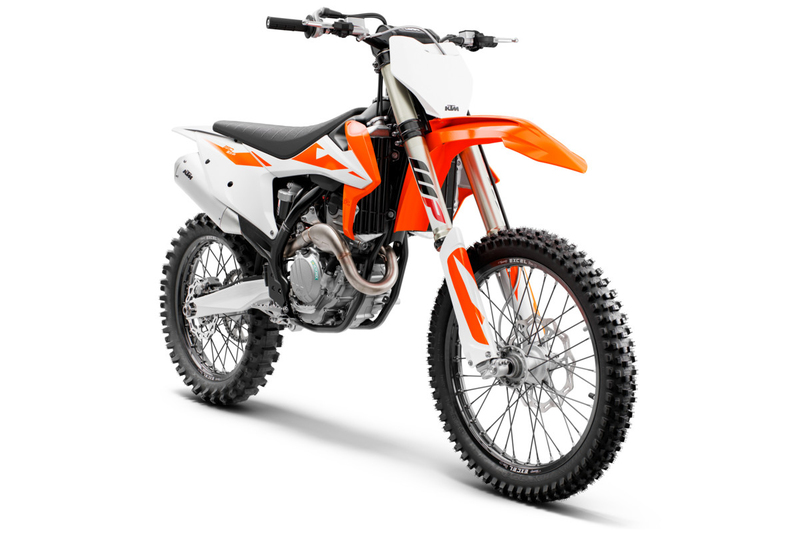 There is a newly developed diaphragm steel clutch that hosts a one-piece outer hub and a primary gear made of high quality billet steel to assist in even longer clutch life. Re-equipped with the Brembo hydraulic clutch system, you can be guaranteed the clutch has a very easy and precise action. 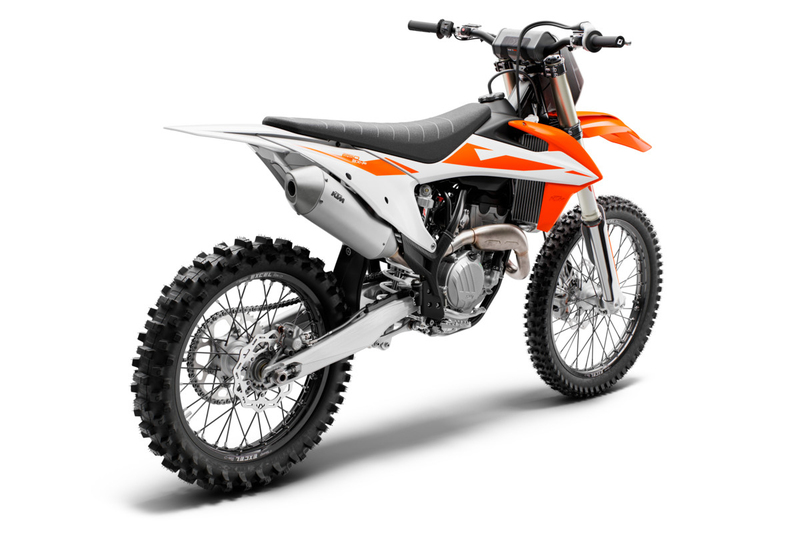 Along with its other four-stroke counterparts, the 250 SX-F features a newly designed exhaust system where a new model specific header is incorporated with a new advanced design resonator system, providing more performance out of the engine whilst reducing noise. The air filter box has been completely redesigned to improve performance and throttle response, while also offering a clever design that maximises protection against dirt and grime getting into the intake. 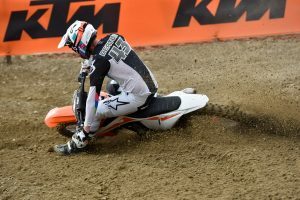 The frame has received big upgrades compared to the predecessor model and is the most stable and well balanced frame of the new generation KTMs. 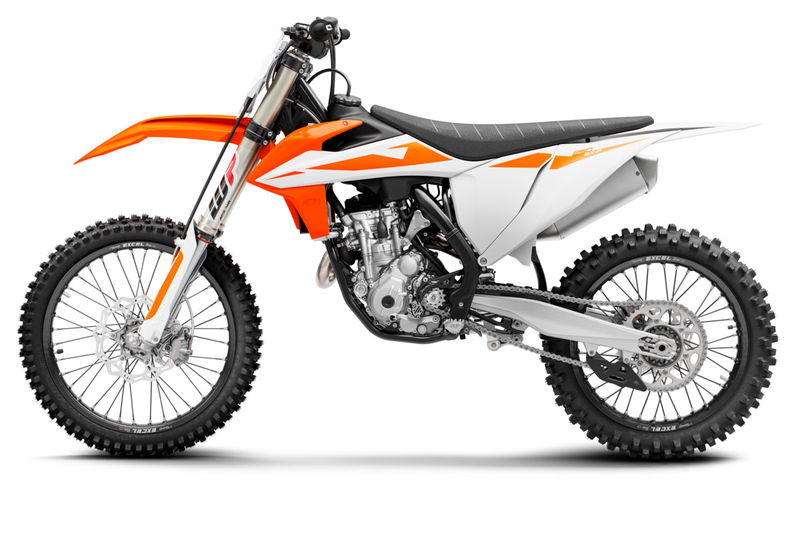 In addition to the frame being upgraded, the swingarm and subframe also received some attention with the rear axle slot being made longer, as the subframe was extended 40mm to increase the rear fender stability. 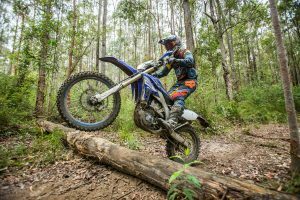 The engine is quite action-packed on the 250 SX-F and, just like the previous model, it loves to be revved. 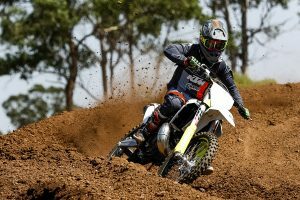 There is something about riding the 250 that just makes you ride the bike so much more aggressively – I’m almost certain that it’s the fact that these things are so hard to over-rev it creates the excitement of really being able to use all the power so well. 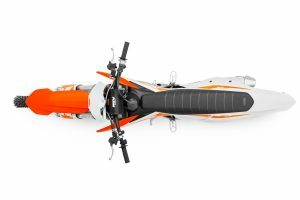 The engine builds off a smooth, yet torquey bottom-end that is very useable at the throttle, which really assists in keeping your line in the turns. It transitions into a very impressive mid-range power that hits hard and slingshots you out the exit of the corner. 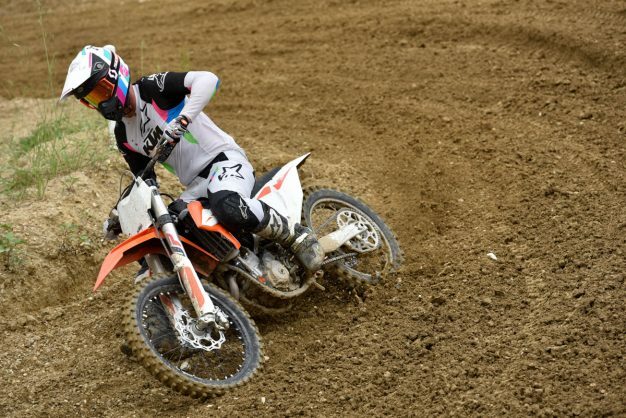 As soon as you get the rpm high on this bike, it bursts to life – it ate up the steep hills and sandy turns with ease, and really made the track enjoyable to ride. There is almost no limit to the rpm on this bike and once you really get it revving that’s where all the fun is to be had. You can really limit the gear changes you have to normally make on a 250F because it has such a long rev range that suits the transmission perfectly, you could play around with some gearing to shift the power to where you prefer depending on what kind of level you ride at, but this engine package definitely won’t disappoint. The power to weight ratio of this engine is so impressive along with the balance, I couldn’t get my head around how smooth the bike rolled and there was absolutely no noticeable weight distribution when you shut the throttle off. The central masses of this engine have been engineered to perfection giving you the smoothest ride possible. Equipped with a majorly upgraded chassis in 2019, this 250 SX-F provides the ultimate balance between power and handling – I couldn’t believe how well it performed in this department – you could seriously turn this bike backwards on itself without even trying. The ability to ride this motorcycle fast was almost made effortless by the handling characteristics. It held up phenomenally riding hard into the turns, and under brakes the chassis is balanced so well that it handles the bumps very precisely, giving you the confidence to attack them. 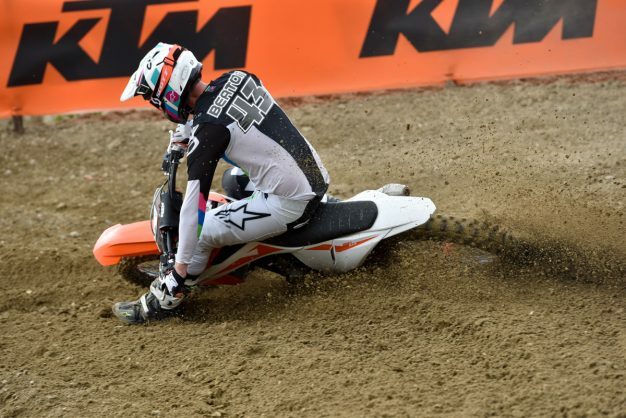 No matter how hard I rode into the breaking bumps, I couldn’t really get the rear of the bike to kick sideways – it would always seem to react in a straight line which delivered a great deal of predictability and created confidence to push even harder around the track. It was much the same under acceleration, the shock absorbed all the little square-edge bumps with complete comfort all while driving hard out of the turns and not losing traction. The WP AER 48mm air fork really compliments the shock and chassis set-up, at times in the past I’ve found the air fork to be harsh and really fatigue my hands and arms, although in this new chassis design, that thought didn’t even cross my mind. I had a lot of front end traction and stability with every lap I completed and it held up under hard braking on the steep down hills while still maintaining a plush enough initial stroke to keep the front wheel planted through the turns, even with sudden direction changes and long downhill off-cambers. The engineering team has really hit the nail on the head with this one, because it’s rare that you can get a chassis to perform this great in all aspects of steering, high and low speed handling all while providing a very comfortable ride. My final thoughts on the 2019 KTM 250 SX-F are that this was the surprise package for me, I really didn’t expect it to be as powerful or as fun as it was. 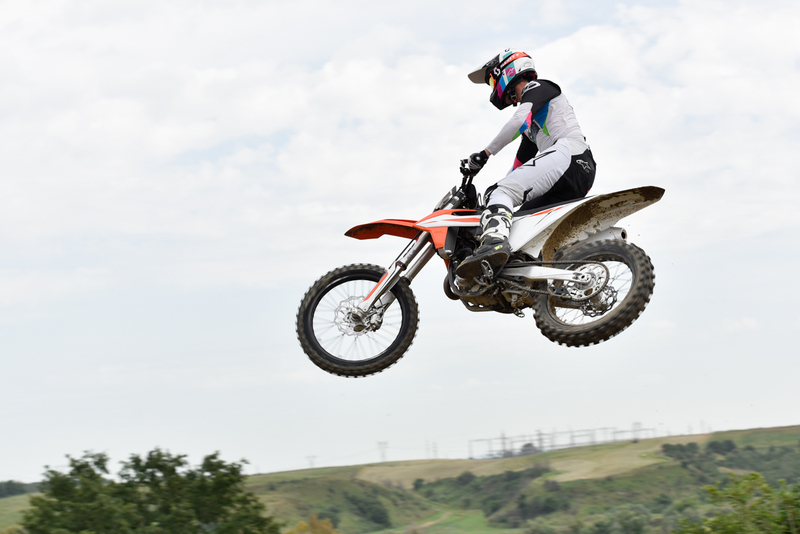 It had been some time since I had ridden a 250F and this really bought some excitement back. 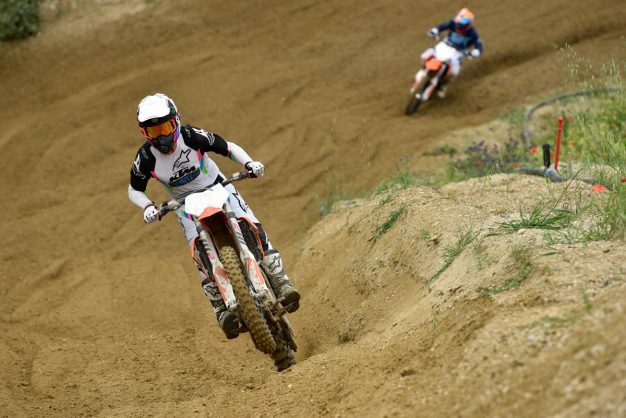 You could pound out lap after lap with an ear to ear grin on your face. The harder you ride the 250 the better it performs and having such a high revving engine it makes you want to ride fast. I think this bike offers such a comfortable ride while being the ultimate racing machine of its class.